What is Viapass in Belgium? 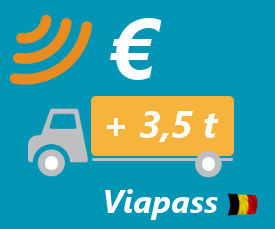 Viapass is a new kilometre-based road tax for Heavy Goods Vehicles driving in Belgium. The kilometre charge “Viapass” replaces the former “Eurovignette”. Each truck transitting on Belgian roads has to be equipped with an OBU (On Board Unit) which will calculate the toll to be paid depending on the number of kilometres travelled in the area. Invoices will then be issued and sent on a regular basis. When did Viapass take effect? Viapass took effect as of the 1st April 2016. Can I recover VAT on this Belgian kilometre charge system? Only one of the 3 Belgian regions applies VAT on this road tax: Wallonia (southern Belgium) applies a 21% VAT rate on Viapass. This VAT is recoverable. Flanders and Brussels don’t apply VAT on this tax. Please note: you have to provide us with the invoices issued by SOFICO in order to recover your VAT in Wallonia. For the moment, these invoices are issued per truck and per period (every 14 days), which may amount to a significant number of invoices depending on the size of your fleet. You can visit the website http://www.viapass.be/en/ or contact your usual supplier of toll solutions in order to comply with Viapass regulation. If you have any questions about VAT recovery on Viapass in Wallonia, please feel free to contact us.